When it comes to dating archaeological samples, several timescale problems arise. For example, Christian time counts the birth of Christ as the beginning, AD 1 (Anno Domini); everything that occurred before Christ is counted backwards from AD as BC (Before Christ). The Greeks consider the first Olympic Games as the beginning or 776 BC. The Muslims count the Prophet’s departure from Mecca, or the Hegira, as their beginning at AD 662. The Mayan calendar used 3114 BC as their reference. More recently is the radiocarbon date of 1950 AD or before present, BP. Relative dating stems from the idea that something is younger or older relative to something else. In a stratigraphical context objects closer to the surface are more recent in time relative to items deeper in the ground. Although relative dating can work well in certain areas, several problems arise. Rodents, for example, can create havoc in a site by moving items from one context to another. Natural disasters like floods can sweep away top layers of sites to other locations. Absolute dating represents the absolute age of the sample before the present. Historical documents and calendars can be used to find such absolute dates; however, when working in a site without such documents, it is hard for absolute dates to be determined. As long as there is organic material present, radiocarbon dating is a universal dating technique that can be applied anywhere in the world. It is good for dating for the last 50,000 years to about 400 years ago and can create chronologies for areas that previously lacked calendars. In 1949, American chemist Willard Libby, who worked on the development of the atomic bomb, published the first set of radiocarbon dates. His radiocarbon dating technique is the most important development in absolute dating in archaeology and remains the main tool for dating the past 50,000 years. Carbon has 3 isotopic forms: Carbon-12, Carbon-13, and Carbon-14. The numbers refer to the atomic weight, so Carbon-12 has 6 protons and 6 neutrons, Carbon-13 has 6 protons and 7 neutrons, and Carbon-14 has 6 protons and 8 neutrons. The extra neutrons in Carbon-14’s case make it radioactive (thus the term, radiocarbon). Radiocarbon is produced in the upper atmosphere after Nitrogen-14 isotopes have been impacted by cosmic radiation. Radiocarbon is then taken in by plants through photosynthesis, and these plants in turn are consumed by all the organisms on the planet. So every living thing has a certain amount of radiocarbon within them. After an organism dies, the radiocarbon decreases through a regular pattern of decay. This is called the half-life of the isotope. The time taken for half of the atoms of a radioactive isotope to decay in Carbon-14’s case is about 5730 years. Half-lives vary according to the isotope, for example, Uranium-238 has a half-life of 4500 million years where as Nitrogen-17 has a half-life of 4.173 seconds! Looking at the graph, 100% of radiocarbon in a sample will be reduced to 50% after 5730 years. In 11,460 years, half of the 50% will remain, or 25%, and so on. When Libby was first determining radiocarbon dates, he found that before 1000 BC his dates were earlier than calendar dates. He had assumed that amounts of Carbon-14 in the atmosphere had remained constant through time. 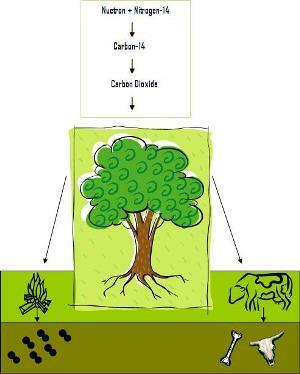 In fact, levels of Carbon-14 have varied in the atmosphere through time. One good example would be the elevated levels of Carbon-14 in our atmosphere since WWII as a result of atomic bombs testing. Therefore, radiocarbon dates need to be calibrated with other dating techniques to ensure accuracy. Plants are not the only organism that can process Carbon-14 from the air. Plankton absorbs, Carbon-14 from the ocean much like terrestrial plants absorb Carbon-14 from the air. Since plankton is the foundation of the marine food chain, Carbon-14 is spread throughout aquatic life. Shellfish remains are common in coastal and estuarine archaeological sites, but dating these samples require a correction for the “reservoir effect” a process whereby "old carbon" is recycled and incorporated into marine life especially shellfish inflating their actual age in some cases several centuries. In recognition of this problem archaeologists have developed regional reservoir correction rates based on ocean bottom topography, water temperature, coastline shape and paired samples of terrestrial and marine objects found together in an archaeological feature such as a hearth. Long tree-ring sequences have been developed throughout the world and can be used to check and calibrate radiocarbon dates. An extensive tree-ring sequence from the present to 6700 BC was developed in Arizona using California bristlecone pine (Pinus aristata), some of which are 4900 years old, making them the oldest living things on earth. Additional sequences have been developed for oak species in Ireland and Germany, ice core samples, and coral reefs from Caribbean islands. These sequences have helped to calibrate radiocarbon dates to calendar years, thus making them more accurate. Normally after 12,500 BP, the coral dating is used. 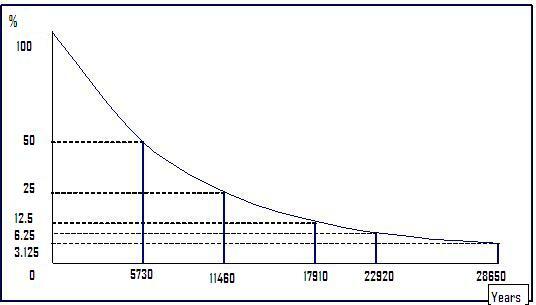 Example of calibration: 3700 ± 100 BP (P - 685). The first number corresponds to the years before present. The second number is the standard deviation or error for the date. It creates a date range of 3600 - 3800 years before present that the sample can fall under. The letter in parenthesis is the lab the sample was shipped to, in this case Philadelphia, followed by the lab analysis number. 1983 Archaeology: An Introduction, 3rd edition, Philadelphia: University of Pennsylvania Press. Pp. 114-123. 1996 Archaeology: Theories, Methods, and Practice, 2nd edition. London: Thames and Hudson. Pp. 111-162. 1998 Archaeology, 3rd edition. Fort Worth: Harcourt Brace College Publishers. Pp. 186-194.